Following on my last blog about a visit to the Polynesian Voyaging Society and a meeting with Nainoa Thompson, this is a short Think Piece I wrote in early September 2011 as part of my studies in the Asia Pacific Leadership Program. It’s about a boating disaster and ties-in with my last blog post. Enjoy! On March 16, 1978 more than 10,000 people were at Magic Island, Oahu to see the crew of the Hokule’a set-off on their epic self-navigated journey to Tahiti. What should have been a joyous journey quickly turned into disaster. This could likely have been averted had an unnecessary risk not been taken, which then cascaded into a series of other risks. 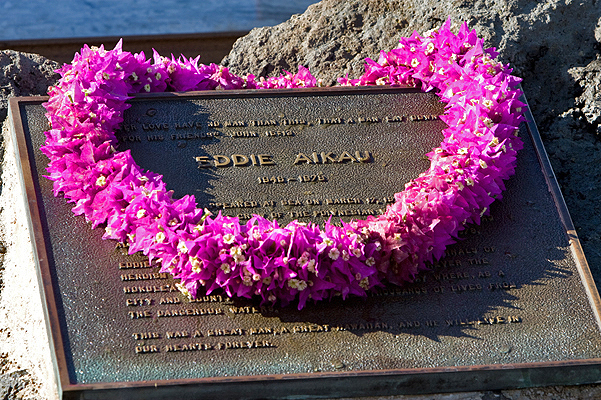 One day later the boat was capsized and one of its crew, Hawaiian surfer and North Shore legend Eddie Aikau was missing. Extrapolating from one of Week 3’s themes – Risk, I drew some parallels from a book I just finished reading, “Eddie Would Go” by Stuart Holmes Coleman. 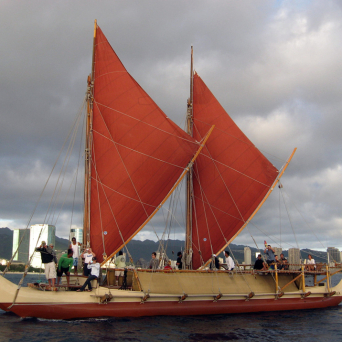 The Hokule’a’s mission of navigating by stars in a traditional Polynesian boat was conceived and managed by the Polynesian Voyaging Society (PVS). While their goal was lofty, they’d spent a good deal of time training and selecting a diverse crew, ensuring their sky navigator was up to the task and were more or less ready to go. On the day of departure weather conditions were less than ideal. High seas and offshore gales led many crew members including Captain David Lyman to suggest a delay of departure until weather improved. With a mass of media and politicians present, PVS President Mike Tongg and his board didn’t want to suffer a PR embarrassment and insisted departure continue as planned. This unnecessary risk set into motion a series of risks that would ultimately lead to Eddie’s death. That evening, weathering 15-foot seas the Hokule’a’s hull filled with water. Prior to departure the Captain had asked that rubber gaskets to seal the hatches be installed but the modification had been refused by the PVS. With large waves breaching the hulls, the hatches leaked and no amount of bailing could prevent the boat from flipping. The craft overturned so quickly the crew was unable to locate and salvage the Gibson Girl radio and the Emergency Radio Beacon, greatly reducing their chance of rescue. They spent an arduous night hanging on to the boat, fighting terrible weather and praying for a rescue which didn’t come. Eddie was a strong character with a lifetime of experience in the water and respected as one of Hawaii’s greatest surfers and all-around water god. Despite there being a cardinal boating rule of not leaving your vessel until it totally sinks Eddie suggested to the Captain on the first evening that he paddle his long board to the nearest island Lana’i for help. He was denied. The next morning with some crew members desperately sea sick and the Hokule’a drifting out of traditional shipping lanes, Eddie again asked the Captain to let him paddle the now 20 miles to Lana’i. Eddie being such a strong character and rescue looking unlikely Captain Lyman violated sailing protocol and gave Eddie the “okay” to go for help. At 10:30am on March 17 Eddie paddled-off and was never seen again. To this day Captain Lyman struggles with his decision and one wonders had the Hokule’a not left port in poor weather on the 16th, if Eddie would still be alive? Cascading risk had taken its toll.